Recommending herbs for both well-being and minor ailments, Home Herbal: The Ultimate Guide to Cooking, Brewing, and Blending Your Own Herbs offers a wealth of practical advice on the medicinal, cleaning, and consumptive uses of herbs. Featuring an A-Z directory of 100 key herbs, with information on how to grow, harvest, prepare, and use them, Home Herbal: The Ultimate Guide to Cooking, Brewing, and Blending Your Own Herbs emphasizes what anyone can achieve in their garden and kitchen. I once tried to plant a herb garden and failed miserably. My mom bought me one of those herb garden starter kits. I followed all the directions (or so I thought), but the herbs bloomed then died. I figured it was a result of my black thumb. That was over 10 years ago and I’ve never tried since. However, I’ve been itching to give it another go and see what happens. Maybe it will be different this time? I guess I won’t know until I try right? I’ve been mainly using storebought fresh herbs in cooking, but after reading Home Herbal by DK Publishing, I realized that there’s so many other uses. Yes, you can use herbs in cooking, but you can also use them for making salves, balms, scrubs, smoothies, teas and many other uses! Home Herbal opened up my eyes to the wonders of herbs. The book begins with the A-Z of Herbs providing insight into 100 medicinal herbs. You’ll learn how to use each herb to cure common ailments and how to grow, forage and harvest the herbs. I recognized quite a few of the herbs, but there were still many I had never heard of before. It was interesting to see how they were all used and I marked a few of them down to research further. The next section is titled Use Herbs and tells you which herbs to use to treat 10 common health issues. For instance, they had suggestions of what to use to aid in digestion, circulation, coughs and colds, muscles and joints, pregnancy and childbirth and more. It also lists which herbs to avoid in pregnancy. Heal from the Inside is packed full of recipes for drinks, tinctures, soups and salads made with herbs, of course! I want to try the Tomato Salsa Juice for improved digestion and the Green Bean and Cilantro Soup for cleansing. For a snack, I’d munch on the Four Fruits Power Bar that helps nourish the blood. Heal from the Outside shows you how to make a variety of creams, soaps, bath soaks, hair treatments and more. I want to try the Rose body butter and Minty fresh foot cream. The winter has taken its toll on my skin. I enjoy making scrubs and I’ve got many new recipes now to try thanks to this chapter. Finally, there’s a small section at the back of the book on how to grow herbs yourself. It also shows you how to forage wild herbs and even how to buy the best fresh (or dried) herbs when you are out shopping. 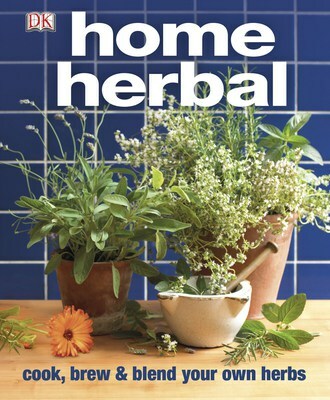 Home Herbal has inspired me to use herbs more often whether its in a recipe, home remedy or beauty treatment. Maybe I’ll try my luck again and see if I can successfully have an herb garden. We’ll see I guess! Check out the other books featured in DK Canada’s Earthly Pleasures Boutique on for 30% off for a limited time only. Also, find it on Amazon.ca. My daughter loves fresh herbs. We tried our hands at doing herbs on our back porch, but they didn’t work too well. Maybe we just needed this book…haha. It does sound interesting. Fresh herbs not only really add to dishes but many have health benefits as well. A double bonus. Good luck to you and hope to hear about your wonderful herb garden soon. what a fantastic book, lots of wonderful recipes for letting nature take care of your health in more ways than just cooking. Would live to grow herbs someday in my house. Another great DK book! So very helpful for growing herbs. A lot of people I know have to try a few times before getting successful results! This sounds like a great book not just for those wanting to grow herbs, but also for people who want to use herbs in their cooking and to heal. Thank you for sharing this review.